At Dakota Ridge you have options. There is no “one size fits all” adventure here. There are 7 km of snowshoe trails and 20 km of cross-country ski trails, with many loop, making it easy to go for a couple hours or a full day. Season passes and day passes can be purchased at the Sechelt Aquatic Centre or at the Gibsons & Area Community Centre. 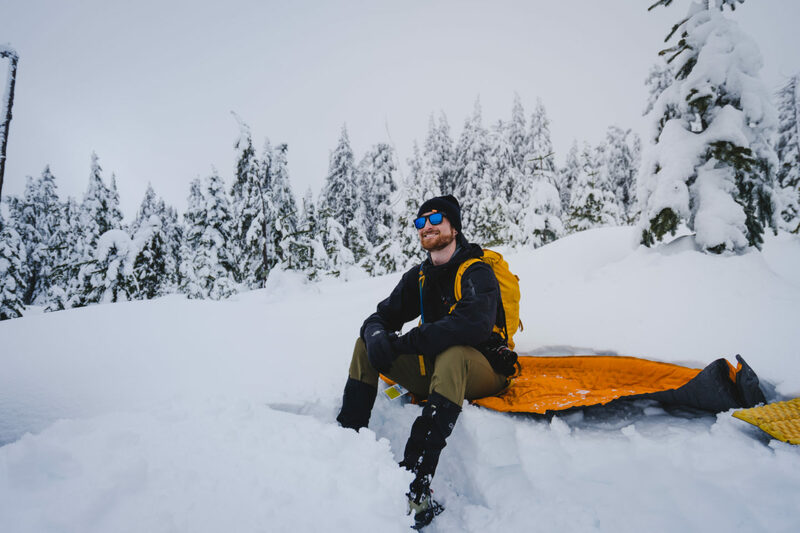 Day passes can also be purchased at the Dakota Ridge trailhead once the season begins (exact fee amount required), at Alpha Adventures, and Source for Sports in Sechelt. Taking a break while snowshoeing at Dakota Ridge on the Sunshine Coast. If you are planning to snowshoe, head up the Balsam Loop/Ridge Walker trail, located just to the right of the main map board. You’ll cross several “intersections” with cross country ski trails that run perpendicular to the snowshoe trail—so always be on the lookout for skiers. 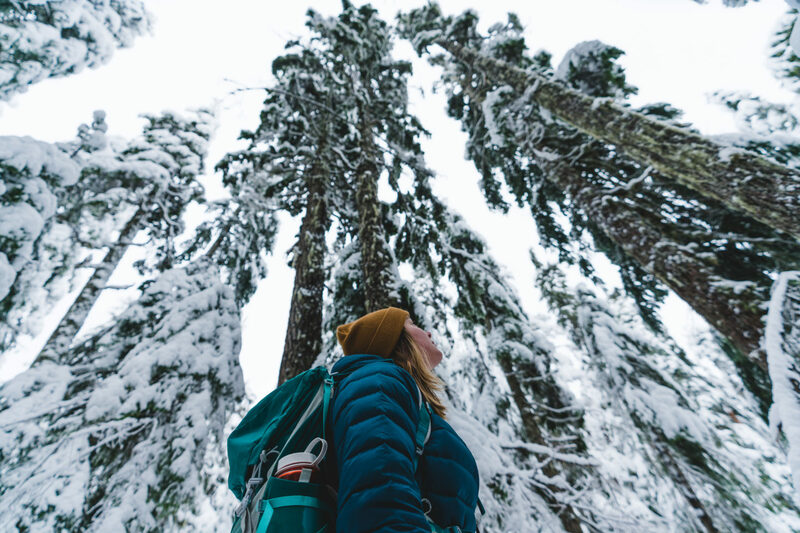 Once you’ve passed the last ski intersection, you’ll head up a bit further before coming to a fork- where you’ll be choosing to head left to the top of Dakota Ridge on the Ridge Walker trail, or to right onto the Balsam Loop trail. The Ridge Walker trail is a bit more uphill, but provides a longer hike and the trail winds over frozen ponds and opens up into almost meadow like conditions—full of pristine snow. Take the loop around and then head back down the trail, where you will connect with the Balsam Loop. Should you choose to go right at the fork, the Balsam Loop is where the wide open views await you. On a clear day, you can see as far as Mt. Baker in Washington State, as well as the coastal mountains, Vancouver Island, and plenty of ocean in-between. Once you’ve soaked in your views (and hopefully taken lots of photos), this trails loops around and back to the map board at the base next to the warming hut and the parking lot. To access Dakota Ridge, turn north off Highway 101 onto Field Road (between Sechelt and Roberts Creek). At the end of Field Road, turn right onto the logging road, and follow the signs up the rest of the way (about 14 km total drive). It is a good idea to have your chains on or at the ready before moving into the snow zone. The Sunshine Coast Regional District, in cooperation with community volunteers, maintains the road to Dakota Ridge and the trail system. For those not prepared to drive in winter conditions, Alpha Adventures in the Wilson Creek Plaza offers a shuttle service, as well as day ticket sales, snowshoe and ski rentals, tours, lessons, and sales. There is 1 geocache in the park. If geocaching is new for you, it’s a real-world treasure hunt, so don’t miss out on the fun.